A choice of efficient and effective training styles, a brand-new approach to dental education and a broad and structured training programme. These are just three reasons why you should undertake your Dental training in the East Midlands. Thanks to the unique geography of the region you can benefit from high quality training at a range of centres without a long commute or the need to move home. With three of England's leading cities, world-class sport, art and music and one of the best social scenes in the country, the region offers a superb Dental programme and an unrivalled quality of life. Keep reading to find out more about why you should come to the East Midlands for your Dental training. The East Midlands has recently seen the creation of a brand new Postgraduate Dental School. We have been able to build a brand new organisation and training programme from the ground up and this means you'll benefit from a Dental training programme designed specifically around the needs of modern dentists and patients. If you're a new graduate you'll benefit from high quality foundation training and if you're more experienced you'll have opportunities in advanced areas including orthodontics and restorative dentistry. We offer training for all dental registrants and so if you want a career as a Dental Nurse, Hygienist, Therapist, Dental Technician or Clinical Dental Technician we have learning opportunities for you. One of the main reasons Dental trainees love working in the East Midlands is because of the high quality work/life balance. The region boasts superb transport links and the proximity of the various centres means you gain a wide experience without a long commute or the need to move home. 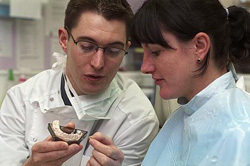 Dental registrants are based in 6 major teaching hospitals across the region. You'll learn core medical skills that will support you and your patients throughout your career and develop advanced skills in all surgical aspects of dentistry. And, with the programmes centred around large towns and cities it's easy to get experience in a range of facilities while enjoying a stable family and social life. House prices in the East Midlands are also extremely affordable. The average house price is 25% lower than the South West, 44% lower than the South East and 62% lower than London. And, it's just 67 minutes from Leicester to London by train. When you come to the East Midlands for your Dental training you're coming to one of the most vibrant and thriving regions in the UK. On your doorstep you'll find venues hosting world-class music, drama and theatre. You'll find the country's most established comedy festival, the biggest Diwali celebrations outside India and an international film festival. You can also enjoy world-class sport including Premiership football, Test cricket, the British Grand Prix, international water sports and Premiership rugby. And, with hundreds of restaurants, clubs and venues to choose from you're never short of a night out.